I have been so busy decluttering – kitchen, office, lounge, bathroom and, yes, even the sewing room – that I forgot to give you a look at my finished quilt top (Running Out of Steam, Punk). I’m busy piecing the back at the moment and hope to baste it next week. Not a great photo I’m afraid, just courtesy of the iPad. Absolutely love the very dark contrast in the zigzags. Classy quilt. 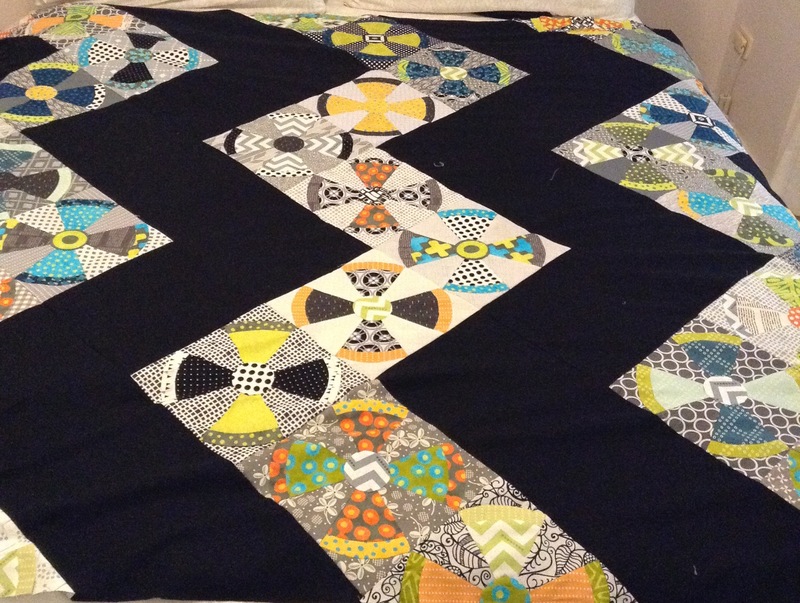 Thanks Dot, I’m planing to zig-zag quilt the black with a multi-coloured thread. At least that’s the plan. I agree with the other ladies. That black really sets off the blocks and makes them stand out.